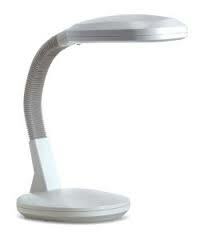 The Desktop Reading Light is a high vision reading light, ideal for the desktop. The flicker free bulbs create a near daylight effect and this means it is very good for reading, writing or studying especially if your sight is not perfect. The strong clear light allows you to read and concentrate for longer. If your vision is not perfect even with glasses then this desk light or bedside light will improve your quality of life. Briefly it is a specially designed lamp using a near daylight bulb for use on the desk. It is absolutely ideal for someone whose sight is not perfect, the print is now much easier to see. Flexible arm adjusts the angle and makes sure that the light always shines at the right height and from the right direction. To put it very simply, if you have difficulty seeing things clearly then put this on your desk and so many visual problems will disappear. OK you will still need to clean your glasses. Sometimes even when they are clean it’s difficult to read because the lighting is poor especially when it is dark or in the winter. The desktop lamp will provide a strong clear light. It helps to make life just that little bit easier. This lamp is extremely easy on the eyes. It is ideal for use on the table with a computer. Best of all the light is perfect both as a desk lamp and as a bed side light. This is a really good lamp. I have mild macular degeneration which means I need a strong clear light to read easily.